Bangladeshi technology firm Solar Electro Solar Electro Bangladesh Limited (SEBL) is awarded by a United Nations agency in Malaysia. 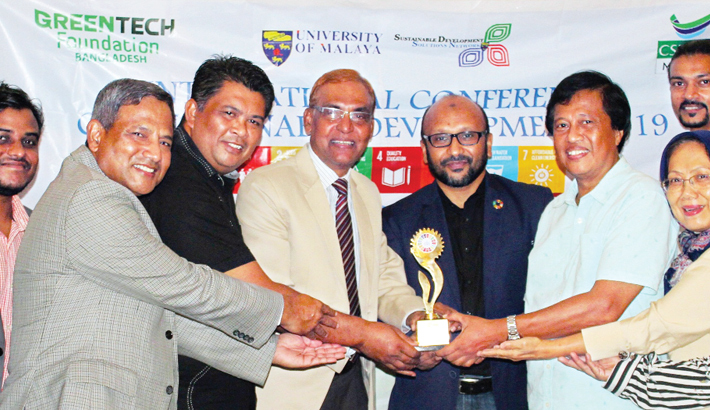 Solar Electro Managing Director Prof Majibur Rahman received the award from Ex-ambassador Dato Abdul Malek bin Abdul Aziz and the Malaysian Prime Minister's Office Ambassador of Dato Mostafa at a conference on sustainable development goal in Malaysia. Chinese firm Green Solar Solutions Chief Executive Jerry Yap also received the award. United Nations Development Organizations UN-SDSN and Center for Sustainable Development in Malaysia jointly organised the conference at University of Malaya. Solar Electro Bangladesh Limited is awarded for generation and supply of power to the people affected by climate change through the establishment of Solar Mini-grid in the off-grid areas of Bangladesh. Representatives from hundred organizations from different countries attended the ceremony.